Was wondering if it was possible and potentially very cool... to use one of my glasses free 3D screened Android devices as a preview window whilst editing 3D images using SPM (Stereo Photo Maker). With very little faff, I got it to work almost exactly as I'd wanted and here is what I came up with... Maybe some of you are interested. You need a Windows PC with SPM. Mine is Windows 7 laptop. 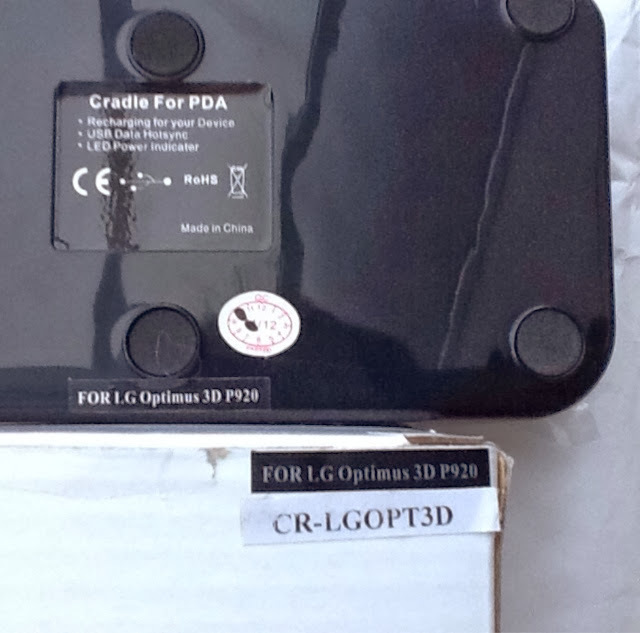 A glasses gree 3D screened Android device. 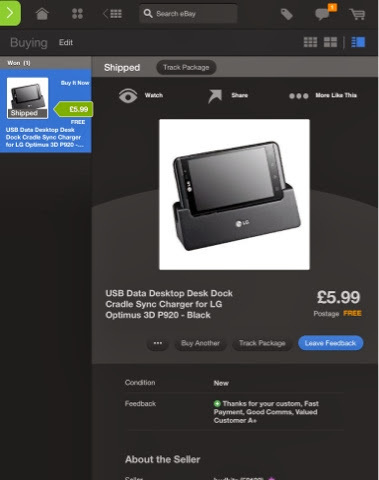 The example I used here is a HTC EVO3D (available cheap off eBay). Install the iDisplay app on both PC and Android from Google Play store. USB data cable serves 2 purposes. 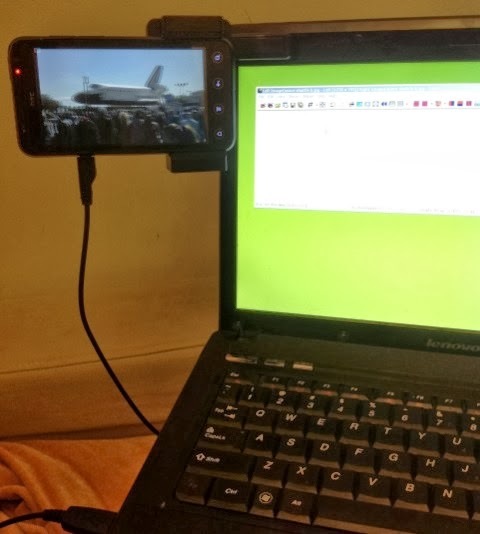 It allows a stable wired connection for passing screen data from PC to Android display. 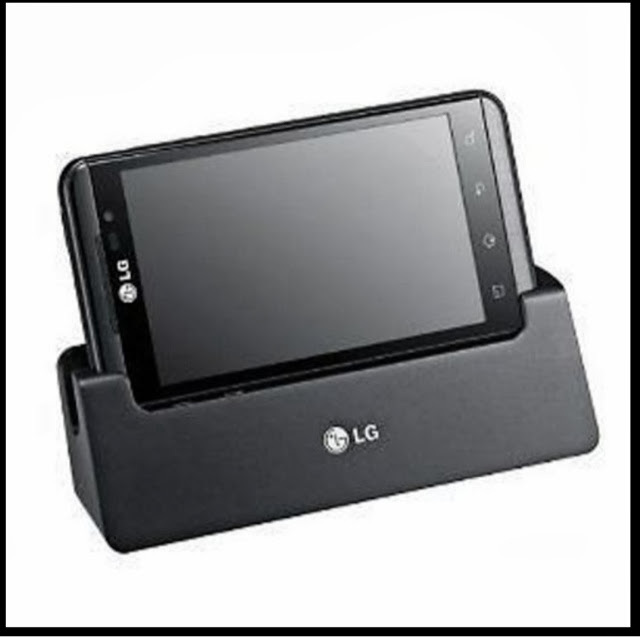 Secondly, it provides some welcome power to charge your android device while it is connected. The USB line between the PC on the phone isn't mandatory, iDisplay's extended display functionality can work untethered via just WiFi alone!!! Have a manual way to switch on the parallax barrier on the glasses free Android device. I used Jmz3D Switcher to manually enable the 3D barrier on my rooted EVO3D. 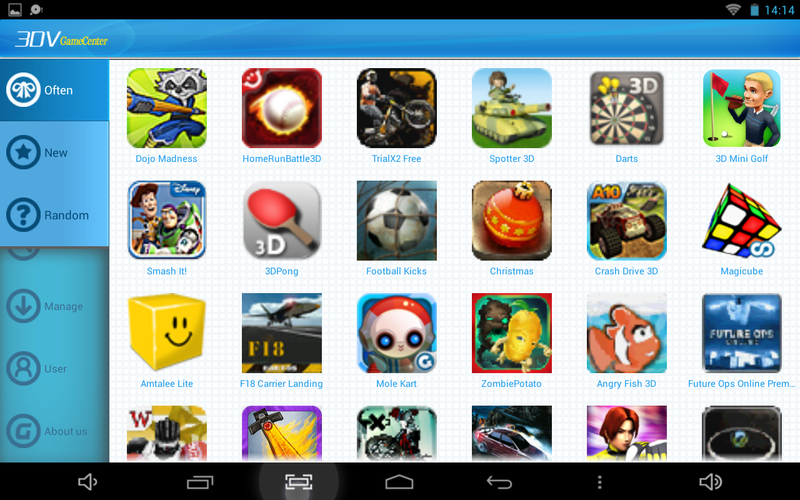 There is a similar utility for the Gadmei 8" 3D tablet thats also available from the Google play store. Would not surprise me if this worked on a Gadmei 8" 3D screened tablet too. I don't have one to test but tell me if you have one and have tried this. Check out "Gadmei 3D Activator"
New improved PQI Air Card II? The original Air Card has been around for some time now, so an update would not be surprising. And right on queue, at least as of early Jan 2014, the PQI website has been quietly showing images of the new Air Card II product. Some Googling around suggests murmurs since as early as Step 2013 even. The obvious physical differences are a new blue body and more dramatically, a new 90° transposition of the microSDHC slot. Unlike the original Air Card's side slotted design, the new version has a rear ended access point, allowing users to conveniently swap out the MicroSDHC card without need for ejecting the Air Card from the device it is already inserted. It is certainly an improvement I am very interested in. Notice the new card has added the SD card read/write protection switch on the side too, which is a handy feature the original missed out on. There are no other indications of any additional internal changes since the original design, but even so, I'd still wait for the newer version puely for the relocated slot positioning. 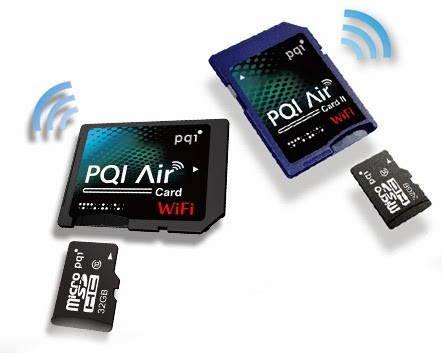 The Air Card was already attractive for its novelty of letting users upgrade the memory with their own larger and faster MicroSD cards as they pleased. None of my existing SD WiFi cards let me do that. Some fantasy features I'd hope the newer AirCard II brings would be faster U1 microSDHC even microSCXC card support, 64G, even 128G card support, improved power efficiency and faster WiFi transfers... But realistically, PQI has not promised us any of these. Just my wishful thinking. Since finding out its existence, I have been searching local stores but they only stocked the original version. I finally contacted the local distributer for PQI products but disappointingly, even they were unable to give a release date. Let's keeps our eyes peeled for this new revision of this WiFi enabled SD card. If you work for PQI, please get in touch with me because I want one! Yesterday! Both taken from EVO3Ds one on left is international, the right is a Rogers. 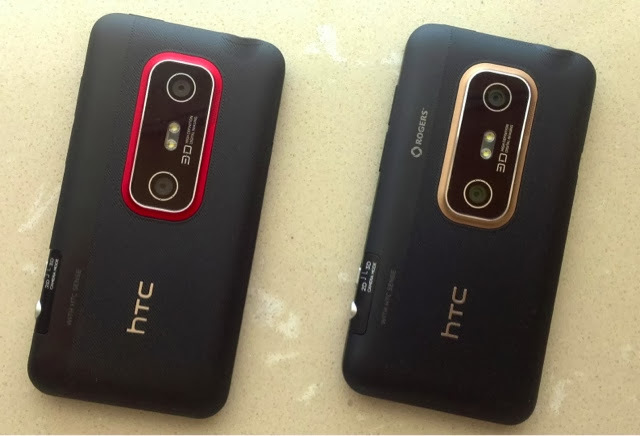 I gathered that HTC originally included twin 5MP sensor cameras in the EVO3D when it was first released. Wow... Twin 5MP 3D camera on a smartphone. That is some clever marketing. If you read the details though, the 5MP sensor was only ever fully exploited for 2D photos. 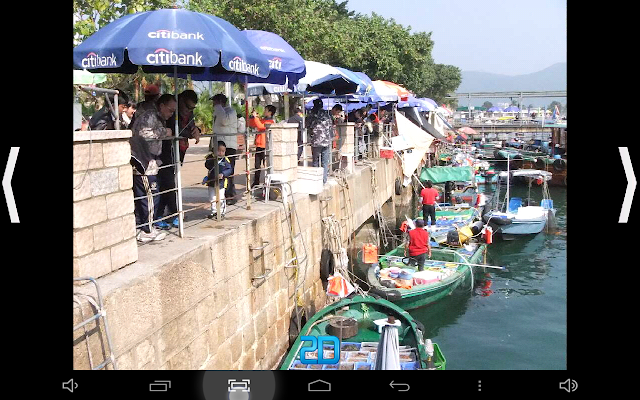 The HTC's included camera app limited it's 3D photo captures to just 2MP 16:9 ratio at 1920x1080 resolution. Which on paper is fair enough, matches the 1080p HD TV standard. Video recording resolution for both 2D and 3D , is maxed out at 16:9 ratio at 1280x720 720p. Since the second rear facing camera sensor was only ever engaged for much lower resolution 3D photo and video capture, the EVO3D would practically never get to use most of the available 5MP. Such a waste... So did HTC release a wonderful new firmware to unlock full 5MP 3D photo and 1080p 3D video capture? No. From an unspecified date, they instead took the opportunity to out a cost effective hardware revision that quietly substituted that one underused 5MP sensor with a lesser 2MP sensor instead. Although the packaging won't indicate it... 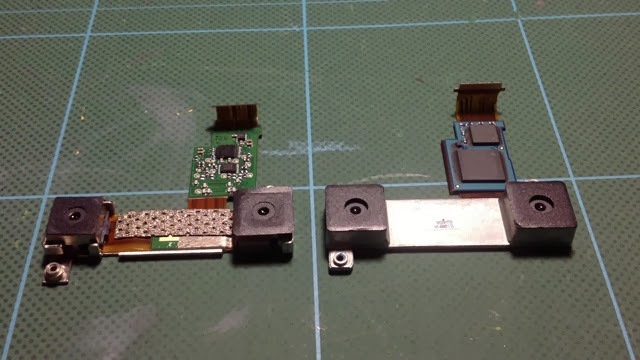 If you have a unit that rolled off the factory floor late in the EVO3Ds production run, there is a good chance you have a 5MP+2MP version. Looking at the phone settings you'd be forgiven for thinking it was still 2 x 5MP too, and functionally, most people probably won't ever noticed the switch. But knowing it bugs me... Dredging the internet, I'd found some folks on XDA forum had a made public an interesting tweaked Amaze camera app for Gingerbread EVO3Ds that would boost the 3D photo to 3MP 4:3 2048x1152. Still not the full 5MP but I'll take it. 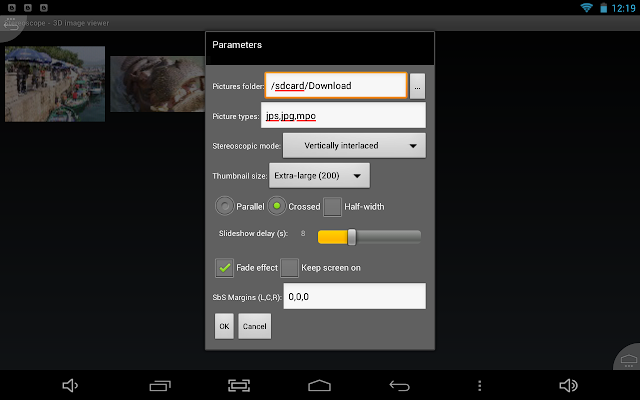 The app also has options to boost the bitrate of the 3D 720p video recordings up to an impressive 20MBs. Which should mean nicer looking video output. The app has 2 builds: if the 2048x1152 version crashes, it is indicative that your Evo3D has a 2MP second sensor. So this was one way to tell if an EVO3D is an early 2x5MP model or not. Unfortunately, the Amaze canera app only works for Gingerbread. The Evo3D I had was already on ICS, and sure enough, the tweaked camera app would force close every time I tried to open it. I had no way to tell if my EVO3D had 2x5MP rear facing camera. I only recently aquired a second EVO3D and was delighted to noticed some differences between them. Inspecting the rear facing cameras, even without removing the back cover, I saw that the Rogers version has more recessed lenses vs the International version. I then proceeded to take them both apart to get a better view of the camera modules themselves. The one on the right with the impressive solid cast metal brace is quite possibly a latter 5+2MP module, it makes perfect sense as a logical enhancement. That once set in place, the sensors should be held securely positioned and well protected from potential shocks that may knock the 2 lenses out of alignment and cause less than optimal 3D capture. I'm hoping the less robust looking module that lacks such reinforcement on the left is perhaps indicative of an older version,but hopefully has a better chance of housing twin 5MP cameras. The 1st image is taken from the eBay Posting. Seller name is deliberately cropped for now. I have saved screenshots. Here is what I actually received. 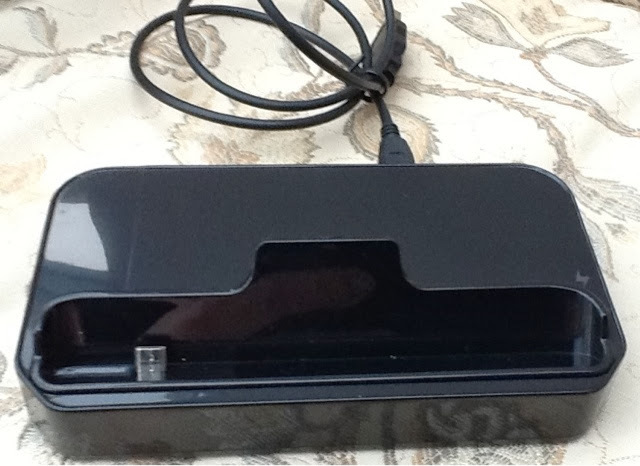 It may still be a usb smart phone dock but pictorially it bears no resemblance to the deceptive image that was used in the original eBay listing. I will be demanding a full refund and return. Supports playback of locally stored MPO and JPS format 3D images. Every time opening the app, we are first presented with a web hosted gallery of 3D images. I haven't figured out which sites they are specifically pointing to. The main menu to the left has English titled tabs, but the image sub categories have thumbnails with Chinese text. The resolution of the 3D sample images is quite variable, some are looking very low resolution at significantly less than 720p. Upon tapping on the desired thumbnails, files are downloaded from the internet into a temp directory, which I notice are in JPS format and commonly the vertical resolution is just 540 pixels (QHD), which is fine for lesser 3D screens, but is not enough to show of the M709 800p 3D to it's full potential. I don't know how often the web samples in this gallery will be updated, but in the 2 weeks I've spent with this app, the images have not changed. I doubt very much that I will be returning regularly to check for new images posted here. Nor can I find a way to post my own 3D pics to share with others via this app. I wish there were a way to hide away the web gallery tabs altogether. Last but by no means least, the "Local Image" tab lets you browse 3D photos stored locally. The "scan path" is easily customisable to point to the internal storage, a mounted micro SD card or an OTG mounted storage device. "Local Image" is easily the most useful part of the app and I wish it was configurable to be the default when starting the app. You are able to browse 2D thumbnails of the MPO an JPS files on your tablet, then load the file you want to see. The image will initially be displayed in 2D by default. A large bright blue label at the bottom center of the screen indicating the current display mode is "2D". Tap on it, or the soft menu key to switch view to "3D" engaging the parallax barrier. The superfluous 2D/3D indicator is thankfully automatically hidden after 3 seconds. I notice this app did not boost the brightness when switching to 3D mode so you may want to l do that in advance yourself as full brightness helps compensate for the activated parallax barier that blocks out some light. There are also < and > signs left and right on screen allowing for navigation to the next or previous image in the gallery sequence. A finger swipe across the screen in either direction performs the same operation. That's all there is to the UI no slideshow options to speak of. I updated to the latest version 1.32 from within the app (menu key>about>version info>update) but could not see any notable differences afterwards. Observed that the Android black bar soft key menu at the bottom of the screen does not hide itself when viewing images. While this might be fine for 16x9 images (since the screen's native resolution gives enough space to accommodate, it is a criminal waste of vertical screen space when displaying 4x3 images. Mostly casual games such as 3D Darts. Surprisingly, there is a licensed Disney Toy Story game called "Smash It". Real Steel boxing is another title I'd heard of before. in both cases, I doubt the developers wrote code to specifically support 3Dscreens. Indeed, the same titles if downloaded from the Google PlayStore are missing the 3D display support. I am not so familiar with the numerous other titles on offer. Nothing from big developers such as Electronic Arts nor Game Loft. 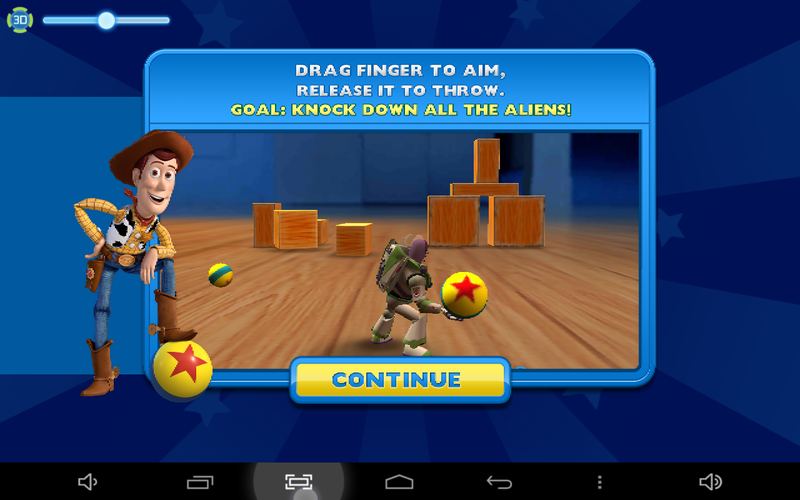 Once installed, these 3D games launch with an added "3D" cog button at the top left of the screen. Tap it to extend a slider bar to set the desired 3D depth. From all the way left to turn off the parallax barrier (ie just plain 2D). Slide to the far right for the maximum 3D depth setting. It works well for the games they've chosen! A genuine sense if depth is seen for the rendered 3D polygons and screen elements such as health bars in Real Steel float as a layer separately from the background action. This is like LG's 3D app converter that came with their Optimus 3D phones, only with less options. The following apps are available from the Google Play store. 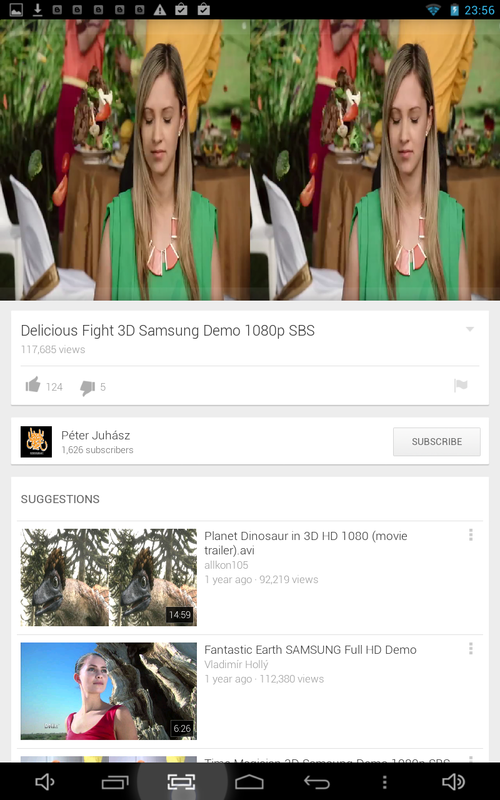 YouTube: ver 5.3.32 A massive ever growing worldwide resource of 3D video content shared freely online. Indispensibly, users can upload and build their own personal repository of 3D videos that is then easily accessed by any bigger screened 3D smart connected TV. However, after installing the current version of the official app from the Play Store it became disappointingly clear that 3D videos simply would not trigger the M709's 3D screen, and instead played them in the plain SBS format. Phereo: ver 1.8 a very useful app for 3D photo sharing for free! Again users can build their own personal repository of 3D photos and review them from any web browser with user selectable anaglyph, wiggle, free view or plain 2D. 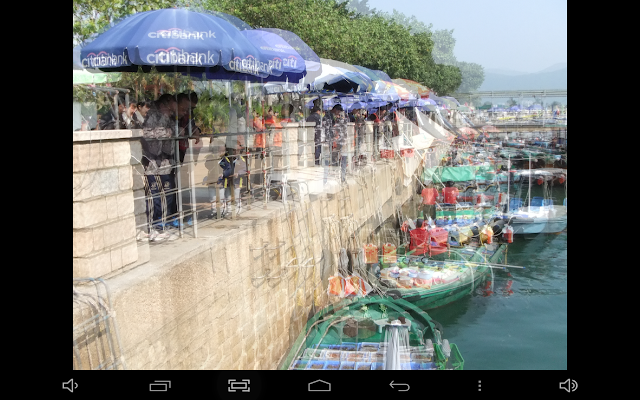 Crucially, it supports many glasses free Android devices with parallax barrier screens. Disappointingly, with the M709, when attempting to change the 3D view mode from within the Phereo settings to "native 3D", we are presented with a pop-up exclaiming "you device does not support this mode." Tobidale 3D: ver 4.1.1 browse and uniquely zoom into locally stored 3D photos with support for many glasses free Android devices equipped with parallax barrier screens. Not the M709. browse locally stored 3D photos and a selection of 3D Web galleries with support for many glasses free Android devices equipped with parallax barrier screens. The M709 could display 3D images if the barrier is stuck in 3D mode. I managed this by playing a 3D video with 3DV Player and switching apps. Set the Stereoscopic mode to vertically interlaced. A clumsy kludge for sure and I count this as a fail too. Far as I can tell, the following 7 " glasses free tablets are the same as the WiFi Megafeis I have here. I conclude this having examined the very similar hardware specs and that they seem to share the same silver earpiece at the front (if the images can be trusted). Note that some distributors (such as Marvel Digital) also offer a version with an additional internal sim slot for 3G voice and data. Otherwise its the same tablet as the WiFi only unit. An Allwinner A20, a dual core Coretex A7 at 1.2GHz, 1GB DDR3 SDRAM memory and a Mali-400 MP graphics chip. This means very little to me. All I really care about is the resulting functionality. Ideally it would be using part of the graphics chip for more energy efficient hardware video decoding rather than a battery draining software codec with just the main processor. So how well can it playback 1080p SBS half width 3D video files without dropped frames. Fortunately with the included 3DV Player, it manages just fine. The reference file is downloaded from YouTube via TubeMate. A 1080p SBS half width 3D video in MP4 format at MB lasting 1min so MB/S. How about playback of 3D video that you may have recorded yourself? Can it playback W3's uniquely formatted 3D video recordings. Note that if it can't, this counts as only a minor fault since to date, neither can any other 3D screened tablet. How about the more standard video formats output when recording from a Panasonic 3D1, a Sony Bloggie 3D, both at 1080p SBS half width MP4. 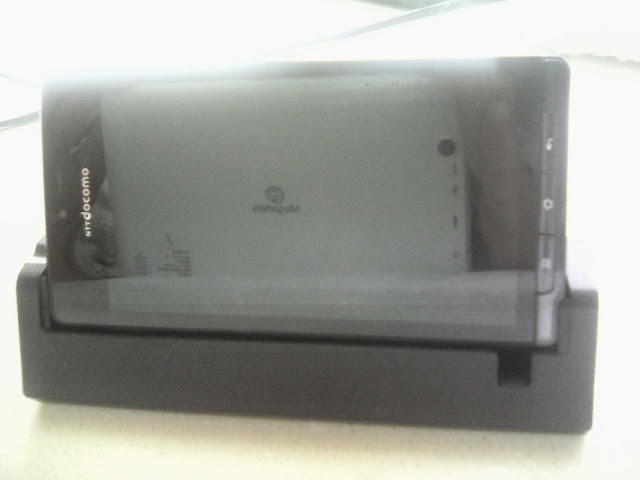 And how about 3D video from a sharp SH12-c, an LG Thrill, AKA the Optimus 3D phones, and the HTC Evo 3D all at 720p SBS half width MP4. Need a table to show the fps, bitrate, file format and resolutions. The 5 point capacitive touchscreen was proven to work with the pre-installed Fruit Ninja. 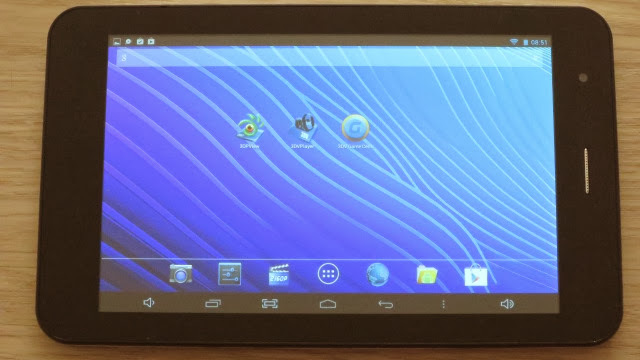 The screen, In 2D mode there is nothing to tell it apart from any other "normal" 2D tablet. It looks fine to me. Visibility, colors, contrast and brightness are quite consistent when I tilt the screen at a wide range of angles. One tell tail sign that this is a glasses free screen is the noticeable 2mm or so air space between the glass front and the surface LCD display itself. I personally like that many modern 2D smartphone displays glue the LCD, the touch panel layer and glass front into a single combined unit. However this tablet's screen is not built like that. To be fair, it is of a similar construction to all the other switchable parallax barrier screens I have encountered so far (including the Truly and Marvel Digital 10" 1920x1200 3D tablets). Perhaps such an assembly is required for current switchable parallax barriers to work their 3D magic... Who knows? Let me have your insights if you have any. Interesting to me mostly for it NOT merely being an 8" Gadmei 3D direct re-brand. Something "newer" perhaps? With more up to date hardware? Purchased this device without really knowing anything about it as there were zero related product reviews to be found on the web at the time. All I could find were some very similar 7" glasses free 3D tablets with different branding. However, I was willing to take a leap of faith, given they offered me a no questions asked return policy within a month. Additional was the 12 month guarantee... which is certainly comforting, even if I would need to pay for the return shipping out of my own pocket. They told me in advance they ship from Shenzhen, mainland China, which isn't too far from Honkers, so would not cost me an arm and a leg to return it if need be. Note I am not at all sponsored by Megafeis for this review... 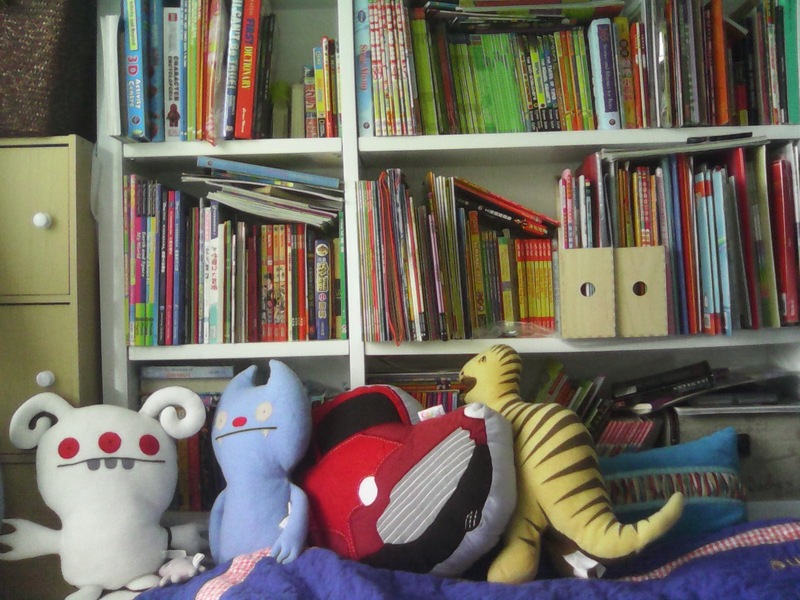 I am a 1st time buyer at their site. Ordering direct from the Megafeis on-line store pagewas remarkably quick and easy, it arrived by courier to my door in a little less than a week. Just in time before the Lunar New Year holidays. Considering the original price of 199.95USD, I'd caught it on discount and paid a much more reasonable 150USD via PayPal with their worldwide free shipping option. To put this in perspective... A Gadmei 8" e8-3D tablet at the same resolution costs 236USD with standard shipping. So the M709 presents itself as a bit of a bargain right? The tablet travelled well protected in a cardboard carton with foam sheets and further corrugated packing inside. Fairly well put together. Not too creaky. No sharp edges. No gaps in the seams between the outer case and the outer bezzel rim and the glass front. I've held much worse tablets in hand. Nothing to write home about it's design looks. Not the ugliest tablet I've set eyes on either. Feels noticeably lighter in a good way vs the Gadmei 8" 3D tablet, but the screen is smaller by an inch and the battery is smaller too. 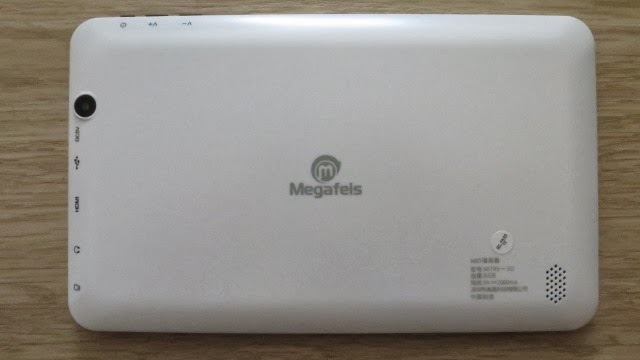 As per most tablets, there's no screws in the casing so I've no idea how to open one of these up to replace the battery myself should I ever need to. Small strip of metalic grill for a front "earpiece". 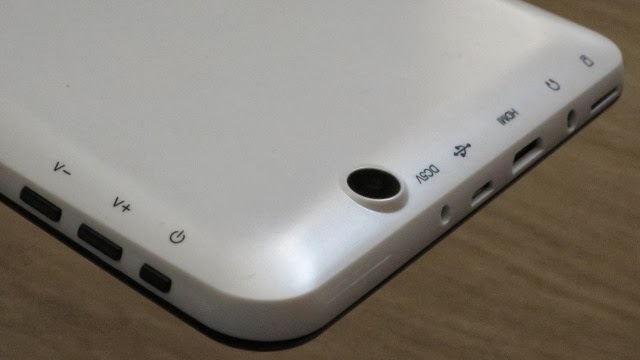 There is a small front facing microphone hole in the glass and the bezel rim too. Placement appropriate for the sibling model that has a sim slot and built-in 3G radio so it can double as an oversized cleverphone for making voice calls and data. Just hold the tablet to your face to talk. I have confirmed, the front earpiece on my WiFi only model is not enabled for voice only WiFi Skype type calls... Tested at the same time, plugging in an iPhone wired headset with in-line mic, it was only able to relay the sound to the ear buds but Skype still used the tablet's own built-in mic. Results are similar for the included dedicated sound recording app. The Android 4.2.2 OS was in Chinese language by default but I managed to switch to English within a few minutes. WiFi was hooked upwithin a couple more minutes. 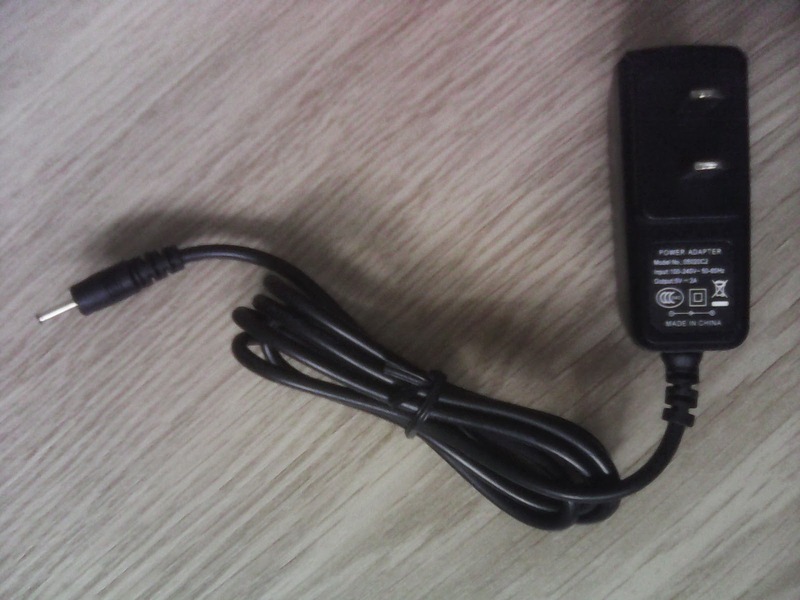 Note that the image of the wall socket charger is taken by the M709's 2mp rear facing camera in daytime indoors.